What's NOT fixed in Vista SP1? Oh, they definitely fixed some problems, but they also didn't fix some (and possibly added some). 1. I think this one is new because I never noticed it before. Open an explorer window and start renaming a file. Change the extension and then left click in some empty space in the explorer window. The "Confirm file extension change" change prompt comes up, left click on Yes. Now very annoyingly a selection box appears. 2. If you open an explorer window, select a file, and then minimise and restore the window the keyboard focus is lost and set to nothing useful (you can visibly see the selected items having the inactive colour). This means you can't use the mouse wheel, left/right keyboard keys, CTRL-C etc. until you click on the item list again. I have no idea how such an obvious bug remained in RTM and even in SP1 - it completely broke my work patterns using CTRl-C and CTRL-V. For more weirdness, after doing this you can press the application/context menu key to see a context menu pop up in a random place. 3. On my desktop with Vista x64 I still see the problem where randomly (although very rarely) some icons in the Control Panel display as blank, useless icons. Reopening the window sometimes fixes it. 4. There's still some issues with the synchronisation of the "File name" field in the "File Open" dialog. In this screenshot, what will happen if you click on Open? 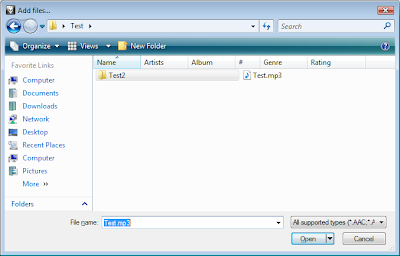 In this instance (the events beforehand matter), it wouldn't open Test.mp3 specified in the "File name" field but rather the Test2 folder. 5. Oh, this isn't my complete list, just the first ones that popped into my head.